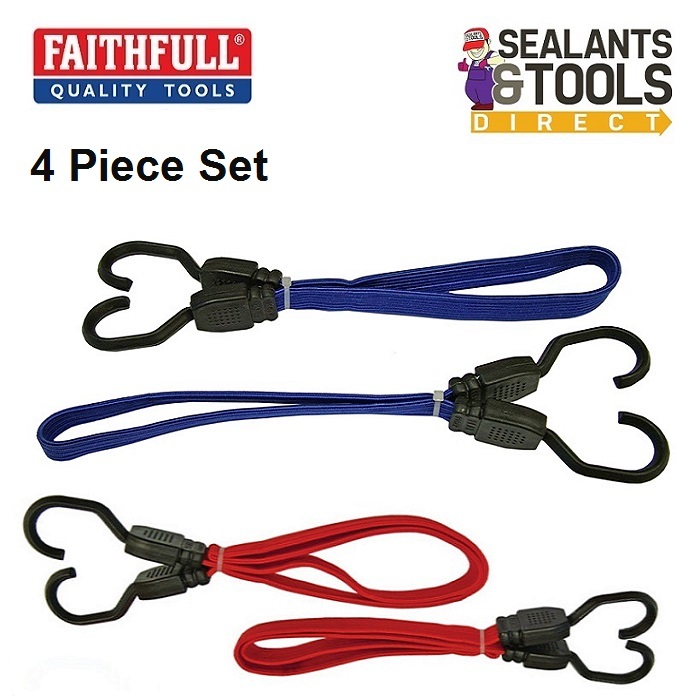 The Faithfull 4 Piece Bungee Set is a useful Flat bungee cord set that make tying items down or in to bundles easy. They are ideal for use in the home, workshop, garage, car, trailer or caravan. Manufactured for a high grade rubber core with a protective polypropylene braid these flat bungees are up to 3 times stronger than standard bungee cords, with super strong steel hooks and a smooth nylon coating to prevent scratching. "Flat Bungee Straps have some advantages over traditional round bungee cord the main-one being it spreads the load over a wider area and helps prevent damage to the goods being secured." See the Full Range of Straps Bungees and Ropes.